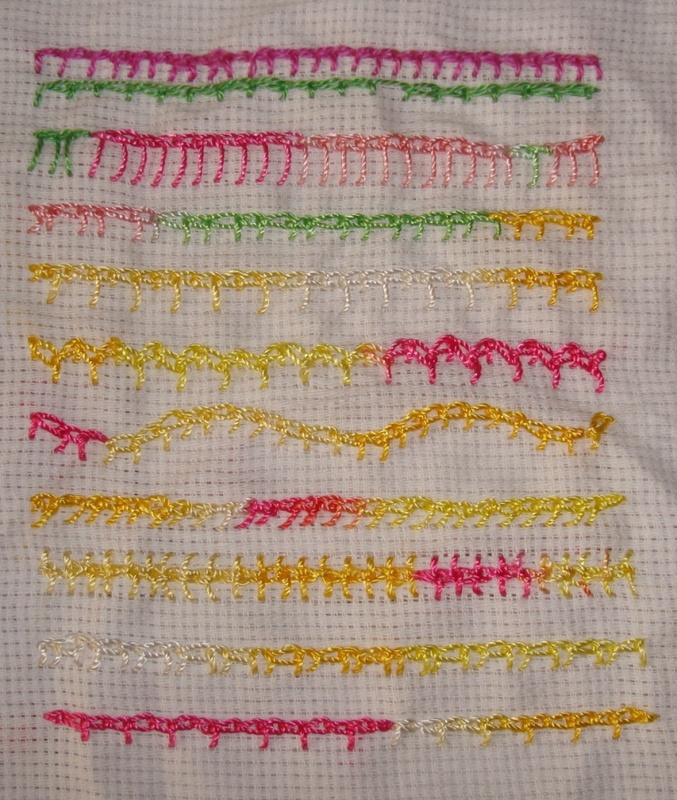 8.Two rows of sailor stitches are worked together in these samples. 9.Three more variations of working two rows of sailor stitch. I wanted try working the sailor stitch with other types of chain and buttonhole stitches. 10. Twisted chain and cable chain stitches are worked in these two rows. 11. 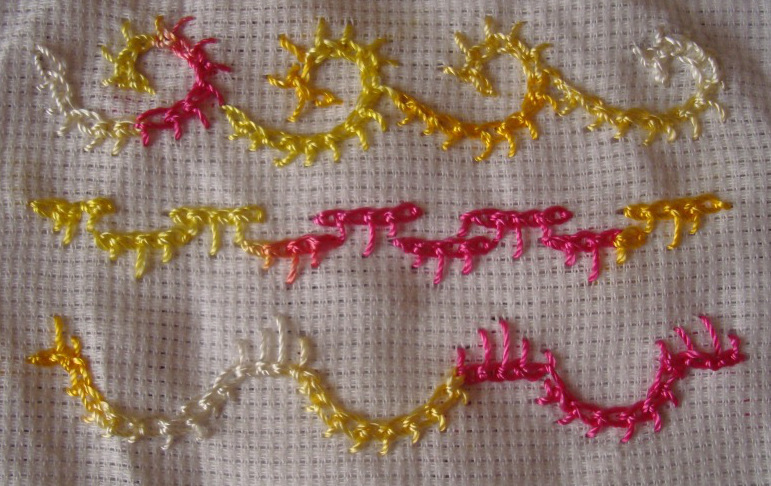 The chain stitches are worked at an angle in the first row, berry stitches in two colours and detached chain stitches are worked with sailor stitch in the second row. 12.Now for the buttonhole stitch variations. The first row is worked with up and down buttonhole stitch, and the second row with closed buttonhole stitch. alternate chain stitches are to be skipped to work closed buttonhole stitch. 13.The first row is crossed buttonhole stitch and the last row is buttonhole wheel stitch. This was simple stitch to work. The chain and buttonhole stitches themselves being versatile, enabled to work many variations. I did not try any other stitches in this sampler. These samples were worked today. 5.The first three rows of sailor stitch was whipped in three ways with dark pink thread. The last row is laced with rimjim thread. 6.The buttonhole stitches are worked on both sides of the chain stitches in the first row. I wanted to obtain a curved look, but this row looks like alternative barred chain. 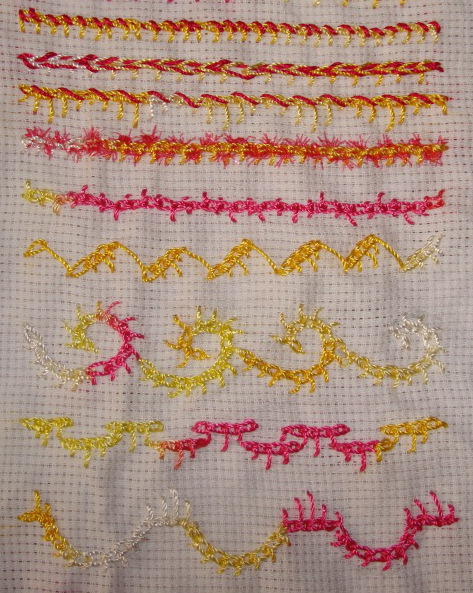 In the second row, the sailor stitch variations are done in v-shape. 7. The sailor stitches are worked in a curve pattern in the first and third rows. A variation of sailor stitch is repeated at two levels in the second row. 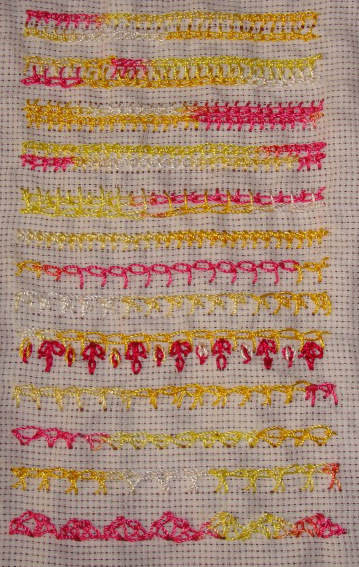 Will try some variations with two rows of sailor stitches worked together from the next sample. Now for the details of the samples, the stiches are worked with cone threads. 1. After working the basic sailor stitch in the first row, the buttonhole stitches are worked short and long in the respective second and third rows. 2.The chain stitches are worked long and short in the first row, the buttonhole stitches are worked long and short in the second row. The sailor stitch is worked zigzag in the third row, I like this variation. 3.The sailor stitch is worked in a curve in the first row. The buttonhole stitches are worked in an angle in the second row. The buttonhole stitches are worked on both sides of the chain stitch in the third row, this variation could be ideal for embroidering worms! LOL! 4.Alternate chain stitches are missed in the first row. Alternate buttonhole stitches are missed in the second row.